Noodles were the first thing I'd ever learnt to make. Needless to say, it was a disaster and had to be scraped off the pan because I had overboiled everything in sight. The second time I tried, it wasn't so bad if you don't count the fact that I had emptied nearly half a bottle of vinegar into it. It took me quite a number of trial and error methods to earn it an 'edible' status. Of course, there is one little thing I still wish to learn, for which I could give my left arm and right leg for. 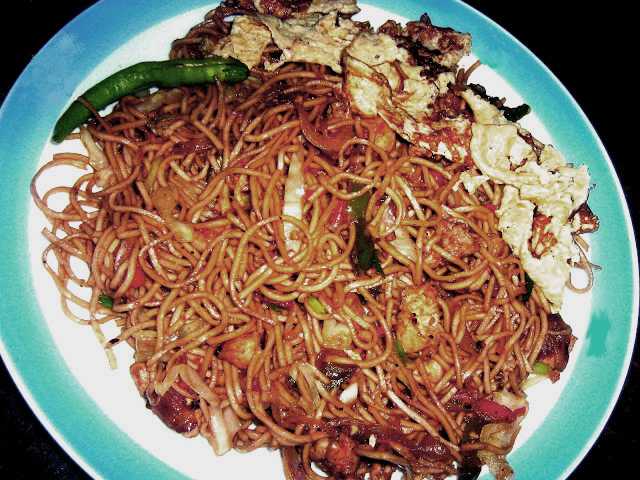 Last evening it was pouring like mad and I had this sudden craving for some spicy noodles. While I had some daal, fish curry and a dead looking soya bean curry lying in the fridge, I decided to give it a miss and dig out a Malaysian stir fried noodle recipe that was lying unattended for long. Now, Mee Goreng is a very popular spicy noodle dish sold along the streets of Singapore and Malaysia by street-hawkers to high end restaurants. You can add as many vegetables and meat of your choice. The original recipe included squid, barbecued pork and chinese sausages. You can also add mushroom, baby corn and bean sprouts for veggies. I skipped those since I didn’t have any. The red chilli paste gives this dish a unique flavor and the much needed zest. You need to cook it on a high flame to retain all the wonderful flavors. Soak 5 dry red chillies in hot water for some time. Then grind the red chillies, 2-3 cloves garlic and shallots to a fine paste. Heat oil in a pan and sauté paste till the oil separates. Keep aside. 1 tbsp soya sauce, 1 tbsp oyster sauce, ½ tbsp chilli sauce and a pinch of sugar and keep aside. Boil the noodles with ¼ tsp salt. Once they are cooked al dente, drain them in a colander. Run the colander through cold water and drain well. Once cooled, spread them on a plate and toss them well with a little oil. This way your noodles won’t stick to each other. Heat oil in a wok or any non stick pan. Add the finely sliced onions and sauté on high. Add the carrots, let it cook for some time before you add the capsicum. Then add the shredded cabbage and toss well on a high flame. Next, add the prawns and chicken and fry well till they lose color and are a little browned on the edges. Add the red chilli paste to this, and toss. Add the sauces and mix well. Add the boiled noodles, salt (you need to be careful with this, since you’re adding soya sauce) and pepper and toss well on a high flame. Add the spring onions, the crushed peanuts and mix. Squirt some lemon juice on top and serve hot off the pan! I am going to give this a try soon. Get that wok. Pretty useful for these Oriental stir fries. What kind of chili paste did you use? Sambal?